First off the bat, let me apologise for the infrequent posts these last few weeks. There are a few reasons for that, not excuses. Its been a crazily busy holiday season, with friends over for Christmas, then a week's trip to see the in-laws which involved driving on the cold, wintry roads for four whole days. And then the cable that connects my camera to the computer acts up, so all these lovely pictures I took are languishing in the depths of a memory card. The cable only works if you hold it a certain way, and to be honest, it takes so long to get it right, that I just do it when I have a full card. Its a pain otherwise. And without pictures, the blog just looks so dull! Then the drain on my kitchen sink decides to back up and leave loads of standing water all over the place. Which means it's impossible to do any dishes and if there's one thing I hate hate hate it is a messy kitchen. Its impossible for me to gain an joy out of cooking when there's a thousand dirty dishes piled up and the dishwasher is playing up by leaking all over the place (well, I may be exaggerating ever so slightly!) I have tried all the natural drain decloggers, but nothing seems to work, so sadly its going to have to be a blast of chemicals to clear it. And to top all of it, the temperature outside has been between -25 and -42, with around 5 feet of snow, and I'll be darned if I am going to wade through drifts as high as my waist! Well, now that I have finished my catalogue of woes (and you've tired of reading through them :-)), there was only one thing that would cheer me up. Ice cream! Luckily I had done a grocery shop before the weather went all psycho on me, so I had the makings of a kiwi ice cream (the fruit, not the New Zealander). This ice cream has a bit of a backstory. I first heard of it when we had a housewarming party. We had a few friends over, and since I had just got my ice cream maker, I asked the kids what flavour they would like to make. J chose vanilla, and S chose kiwi! I was a bit surprised at the choice of kiwi, but it was a challenge. So I found an old Ben and Jerry's recipe and made the icecream. The icecream was delicious, but there was a distinct bitter undertone to it. I put it down to having pureed the kiwi in a blender, and thus crushing up the seeds, and thought no more of it then, because it still disappeared. Then a few weeks ago, I had a tub of Greek yoghurt and a bowl of kiwis going bad. 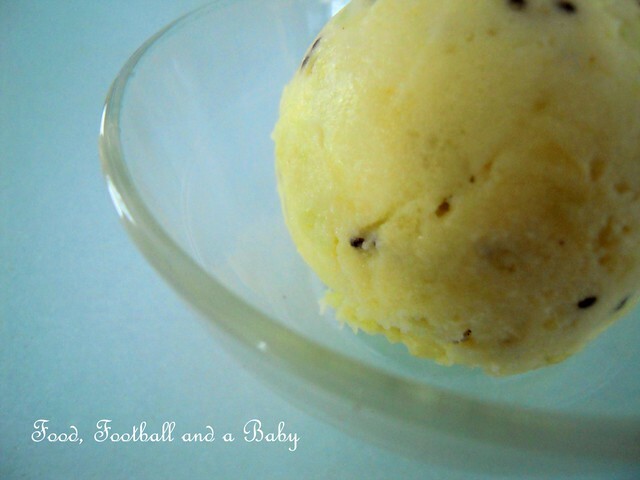 So I decided to whisk up the two and make kiwi frozen yoghurt. This time I mashed the kiwi instead of pureeing it, but to my surprise the bitterness was more pronounced this time around. It couldn't have been the seeds, so I decided to dig around. And to my surprise this was what I found. So it wasn't the seeds, but an enzyme within the kiwi itself that was causing the problem. The site recommended blanching the kiwi in boiling water before using to break down the enzyme. I thought it was worth a try and by this time I was getting annoyed, as my lack of perfect kiwi icecream was becoming a personal nemesis. So when I made this icecream, I modified the Ben and Jerry's recipe, and incorporated the blanching method, along with a few other things, and finally... success!! This icecream was absolutely delicious with no bitterness whatsoever. It had a slight citrus tang to start with before melting into a sweet, creamy kiwiness. And the colour is stunning, the palest of green with darker green flecks and seeds scattered around. The pictures really don't do it justice. The taste of kiwifruit is quite pronounced and I suggest that if you have really sweet ripe fruit, you may want to reduce the sugar down a bit. I also made it lower fat by using half and half (single cream). This recipe uses raw eggs, so using pasteurised may be a better option. If you want to make it lower fat, you can even substitute strained Greek yoghurt for the cream. Do strain the yoghurt first though, as the tang of the kiwi and yoghurt together may make the taste a bit sour. Also, blanch the kiwi for an additional minute or so, to make sure the enzyme has completely broken down. Either way, a taste of this made all my woes disappear, as I float in a blissful ice cream induced haze! The sink is still backed up, the dishwasher still acting nuts, the house is a tip and the child is unwashed, but as Miss O'Hara says, "Tomorrow I'll think of some way . . . after all, tomorrow is another day." Place the chopped kiwifruit in a heatproof bowl, and pour over the boiling water. Blanch, stirring ocasionally for 60 - 90 seconds and then strain out the water completely. Mash the kiwi well. Stir in 1 tsp lemon juice and 1 tbsp sugar and pop into a refrigerator for at least 15 - 20 minutes, an hour if possible. Whisk the eggs and sugar until pale and creamy, then add a pinch of salt and the lemon juice. Whisk in the cream, until well blended. Stir in the mashed kiwifruit, until well mixed. If possible, refrigerate until the mixture is very cold. 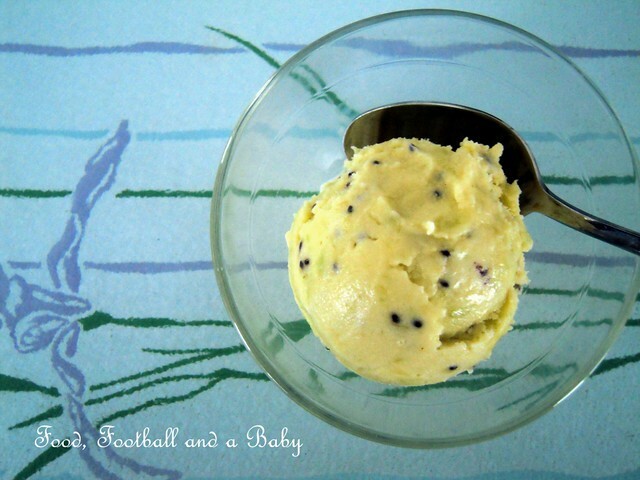 Take out the mixture and churn in an ice cream maker until creamy. Due to the fruit bits in this ice cream, it may be a bit icy. So take out a few minutes and let the ice cream soften up before serving. So that's the secret of using kiwis - this sounds really good. I was thinking it would be really nice if summer ever gets here, but I have to say that I admire your determination in eating it when it's so cold outside. And that's what gets me about Canada... the effing shipping rates :-) I think I'll brave the cold to get to the mall today, thanks Chumbles! Phil, I can eat icecream anytime :-) Though, you're right it would be lovely in the summer. We're lucky here that we at least get a fair summer, even if its short, as opposed to back in the UK where we used to get about four days of sunshine. Interesting flavor! Never try this before and it looks delicious! Mmmm, it sounds delicious! I might have to wait until summer to try it though... it's below zero here too and that weather's just the pits! This sounds refreshing and I love that color of the ice cream. Thanks so much for linking this up with Sweets for a Saturday. I truly appreciate your support. Hope to see you again next week. By then, I'll have a cute button that you can grab and add to your post. @Jacqueline, thanks. I am a cussedly stubborn person, and get very upset when I don't get something right, so have to try till it shows up perfect :-) That said, I am sure you have more patience than you think, you're a mom after all!! @Brownieville Girl, wow, kiwi and lime jam sounds terrific. Have to give that a try soon. Both husband and kid love citrussy flavours, so that sounds right up their alley. @Amy, thanks and I would love to enter. See you at your blog! @Kimberley, tell me about the weather!! We've had a terrible cold snap and its been -24 and lower for the last few weeks. It just saps all the energy outta you. @Moogie, thanks :-) Kiwi is just such a yummy fruit, and so complex. Its easily one of my fave fruits. @Lisa, I love your blog. I've already got my next week's post planned and will be linking it up to you!! I am going to have a very happy husband and child!